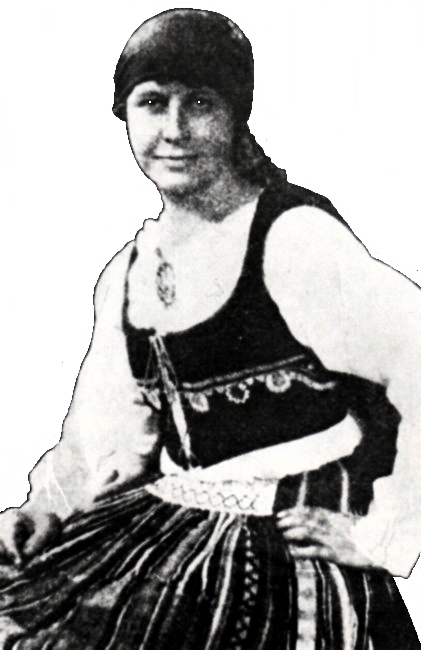 Information: Elizabeth Burchenal (1876-1959), author and editor of folk dance books and a phonograph record. Elizabeth was born in Richmond, Indiana, in 1876, the second of six children, to Judge Charles Burchenal and his wife, Mary. She was educated in the Richmond public schools and attended Earlham College in Richmond as a "Day Dodger," received her A.B. degree in English Literature in 1896, studied at the Sargent Normal School of Physical Education (later affiliated with Boston University), and graduated in 1898. She taught in Chicago and New York and studied at the Gilbert Normal School of dancing. In 1903, she became an instructor of physical education at Teachers College, Columbia University, where she introduced folk dance into the curriculum. While there, her childhood interests in people from other countries took her into the many foreign settlements in New York City, which she found to be rich sources of folklore. Through her friendships with people from other countries, she constantly added to her store of knowledge about their lives, their music, and their dances. She left Teachers College to become Executive Secretary to the Girls' Branch of the Public School Athletic League. She established certain principles regarding folk dancing: 1) there should be no solo dances; 2) no love dances were to be used, and 3) the exhibition element was to be avoided. A policy was adopted to offer free instruction in folk dancing after school. The work was successfully carried on by Elizabeth, and by 1907, 250 teachers were teaching folk dancing to 7,219 girls in 128 schools. In 1909, Elizabeth was appointed inspector of Athletics for the New York City Department of Education, introducing folk dancing into the public school curricula as part of the physical education program. The folk dances themselves were those in which large groups took part; were easy to learn and pass on to others; provided vigorous action, forgetfulness of self, keen interest; and provided pleasure, team work, and the social element. Elizabeth organized folk dance festivals, held annually in the borough parks, hosting as many as 10,000 girls of the Athletic League. The festivals attracted thousands of people from near and far, stimulating the folk dance movement throughout the country. It was during this time that Elizabeth began research in folk dance that became her life's work. Aware of the need for reference material in folk dance, she published her first book, Folk Dance Tunes, in 1908. This was followed by Folk Dance and Singing Games, in 1909. She journeyed to Europe to research material for her next book, Dances of the People, which was published in 1913. Her sister Emma accompanied her and did the musical notation for many of the dances. During the succeeding six years, the sisters visited Denmark, France, Germany, Italy, Norway, Poland, Spain, and Sweden. Other books followed, 15 in all, with dances collected, described, and sometimes translated by Elizabeth. In 1916, Elizabeth formed and headed The American Folk Dance Society, a national folk dance organization. The society was established to study, encourage, and preserve the folk dances, music, and related arts of the United States. A secondary goal was to teach and popularize those wheich were especially adapted for general use, and to serve as a source of authentic information on folk culture, music, and dance. By means of lectures, demonstrations, and workshops, Elizabeth promoted folk dance as never before. In 1929, the society became the Division of Folk Dance and Music of the National Committee of Folk Arts of the United States, with Elizabeth as director and national chairman. She and her sister Ruth developed the Folk Arts Center in New York. The center contained exhibition galleries, a reference library, a museum of American folk arts, a national information bureau, loan exhibitions, and an Archive on American folk dance. Elizabeth represented the United States as an official delegate at several international congresses, including the Folk Arts Meeting of the United Nations Educational, Scientific and Cultural Organization. She was recognized in Who's Who in America and International Who's Who. She received an honorary Doctor of Science degree from Boston University on May 24, 1943, the first academic recognition of its kind to the domain of Folk Arts as a field of study and research. In 1950, she received physical education's highest honor, the Gulick Award. Elizabeth Burchenal died on November 21, 1959, in Brooklyn, New York. The legacy Elizabeth left to the world is many faceted. She was a teacher, researcher, writer, and founder of the American Folk Dance Society. Her contributions to the cultural life of America and to the poeple of the world are immeasurable and a tribute to the woman herself. American Folk Dance Society, Playground Association of America  Committee on Folk Dancing, Victor Talking Machine Co., and Frank M Roessing. Broome, Estelle M. The Contributions of Elizabeth Burchenal to Folk Dancing in the United States. M.S. thesis, Smith College, 1954. American country-dances: collected and edited by Elizabeth Burchenal, Piano arrangements by Emma Howells Burchenal. New York: Schirmer, 1918. (OCLC 20645427, score 968399); 1940. (OCLC 11142294). Bonfire dance = Rinnce mor na teinne: nach National dances of Ireland: by Elizabeth Burchenal: kin G. Reber. ? : ?, 19. (OCLC 6397130). Dances of the People: a second volume of Folk-dances and singing games; containing 28 folk-dances of the United States, Ireland, England, Scotland, Norway, Sweden, Denmark, Finland, Germany, and Switzerland; with the music, full directions for performance and numerous illustrations, collected and described by Elizabeth Burchenal. New York: Schirmer, 1913, 1914, 82p. (OCLC 2376322, 18618980, score 12955036); (OCLC 2376322, 18618980); 1934. (OCLC 1547486, score 12955070); Newly ill. and rev. ed. New York: Schirmer, 1942. (OCLC 9599429). Instructions and music for 5 Danish, 3 English, 5 German, 2 Irish, 3 Scottish, 8 Swedish, and 1 Swiss dance. Descriptive leaflet with photograph in Irish costume. New York, Schirmer, Inc., n.d. (OCLC 9807600). Five folk-dances from Austria, Germany, and Holland; ed. by Elizabeth Burchenal. Boston: Boston Music Co., 1929, 9p. (OCLC 4654920). Folk dance collections by Elizabeth Burchenal. American Folk Dance Society. New York: 19. (OCLC 9807616). Folk Dance Music: a collection of 76 characteristic dances of the people of various nations. Adapted for use in schools and playgrounds for physical education and play. Selected and compiled by Elizabeth Burchenal and Charles Ward Crampton. New York: Schirmer, 1908, 54p. (score) (OCLC 1223716). Selections from Folk Dance Music. (78 rpm monaural 10" sound disc. Burchenal, Elizabeth, and Charles Crampton. Camden, N.J.: Victor, 1920-1939?. Irish lilt, Highland Schottische, Hopp, Mor Annika. (OCLC 11989246). Folk-Dances and Singing Games; 26 folk-dances of the United States, Norway, Sweden, Finland, Denmark, Russia, Bohemia, Hungary, Czecho-Slovakia, Italy, England, Scotland, and Ireland; with the music, full directions for performance and numerous illustrations, described and edited by Elizabeth Burchenal. New York: Schirmer, 1909, 92p. (OCLC 20121650, 12955136); arranged and edited by Elizabeth Burchenal. New York: Schirmer; Boston: Boston Music Co., 1909-22, 3v. (OCLC 1845608); 1913. (OCLC 10265290, 15112136); Rev. ed. New York: Schirmer, 1922-38. (OCLC 7001179, 1933 ed. 615730, 1488826); Rev. ed. New York: Schirmer, 1938. (OCLC 15021113, 3948076). Folk-dances from old homelands: a third volume of folk-dances and singing games containing 33 folk-dances from Belgium, Czecho-Slovakia ...; collected and described by Elizabeth Burchenal. Piano arrangements mostly by Emma Howells Burchenal. New York: Schirmer, 1922, 85p. (OCLC 19072577, 1327091). Folk-dances of Denmark; containing 73 (or 74) dances, selected, ed. and tr. by [Elizabeth Burchenal]. New York: Schirmer; Boston: Boston Music Co., 1915, 95p. (OCLC 2461904). Includes music. The most complete collection of Danish dances. Folk-dances of Finland: containing 65 (or 68) dances, translated and edited by [Elizabeth Burchenal]. New York: Schirmer, 1915, 87p. (OCLC 25225882, 758558); 1943. (OCLC 9641207). Tantoli. Folk-dances of Germany: containing 29 dances and singing games, collected and provided with full directions for performance by Elizabeth Burchenal ... Accompaniments arranged and edited by Emma Howells Burchenal. New York: Schirmer, 1913, 1938. (OCLC 5030640). Instructions and music for 29 (or 50) dances. Folk dancing as a popular recreation: a handbook by Elizabeth Burchenal . . . New York: Schirmer, 1922. (OCLC 4636930, microform 25267244). Folk dancing as a social recreation for adults], by Burchenal, Elizabeth, in Playground, 14:404-16 (October 1920). New York: Playground and Recreation Association of America, 1920. (OCLC 9808340). Four folk-games from Sweden, Finland, Czecho-Slovakia, Elizabeth Burchenal. Boston: Boston Music Co., 1927, 5p. (OCLC 6471804). May day celebrations. Elizabeth Burchenal. New York: Dept. of Child Hygiene of the Russell Sage Foundation, 1910. (OCLC 6853310, micro 25123152). National Dances of Ireland, 1925. Report for 1908-09, as amended by the Board of directors, April 1, 1909. Playground Association of America - Committee on Folk Dancing. Elizabeth Burchenal is here somewhere. (OCLC 9811486). Rinnce na Eirann, National Dances of Ireland, containing 25 (or 60) traditional Irish dances collected from original sources in Ireland by J.M. Lang . . . and national dance music including an original composition by Arthur Darley. With full directions for performance and numerous illustrations and diagrams, edited and described by Elizabeth Burchenal . . . piano arrangements by Emma Howells Burchenal. New York: Barnes, 1924, 136p. (OCLC 2064047, 8095441, microfilm 25123153, 21940203, 1925 & 1926 3301811, 1929 12037234). Three old American quadrilles, Collected and edited by Elizabeth Burchenal. Boston: Boston Music Co., 1926. (OCLC 4654920). Twenty-eight contra dances. New York: Schirmer, 1918. (OCLC 21323248). Vira, music and description of Portuguese folksong and folkdance. New York: Schirmer, 1918. 3p. (OCLC 6471145).